For no reason I can currently understand or justify, I left my favorite gift of all time with our trailer in New Zealand. Jaime made it for me two years ago. It is a large fleece poncho,blue and tan pattern of indeterminate purpose. She cut a hole in the middle for a head, reinforced the neck line, and cut and tied knots along the edges. It's the world's ugliest poncho. I slept with it over my head and shoulders every night in New Zealand. I deeply, profoundly regret leaving it there. The temperature last night dropped rudely and precipitously to 62. So much for one degree at a time. We are not running the heater for these last days as originally planned, because we were unexpectedly run down by a ridiculously large high. Yes, after making three days of record time, Don Quixote dropped ourselves into 300 miles of bright, cold sun and flat calm seas. Normally, we'd just sit here and wait for the wind to build again. Not this time. In a few days, this beautiful calm vista -- right here where we are currently squatting -- is going to be run down by a very nasty low bringing with it rain, thunderstorms, 5 meter (that's 15+ feet) swells, and 35 to 45 knot winds. Needless to say, we are not letting moss grow on the boat. Actually, we are. Seriously, that whole analogy with moss and rocks is a land thing. Turns out the faster you go at sea, the more you feed the barnacles, fungi, and other assorted greens and live things growing on vigorously on the hull. In any case, we fired up the motors and ground away the last 36 hours in a somewhat feverish attempt to get far enough south to slip below the low before it comes in. This is something we haven't done since we left Mexico. Come to think of it, I can't ever remember grinding away continuously for so long. It's wearying in a whole new way, mostly due to vibration and sound. I suspect it would be like taking a 36 hour plane trip. Dull, loud, and it makes your nerves vibrate unpleasantly. 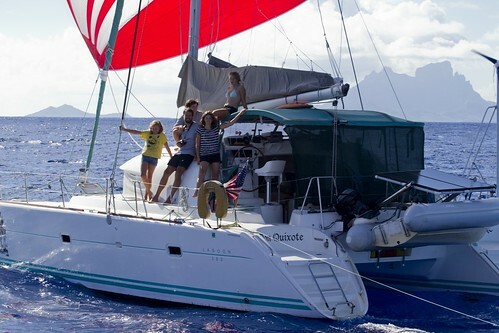 Keep in mind that like many catamarans, Don Quixote has a relatively low fuel capacity. We supplement with jerry cans as well as the 12 gallon separate tank used for the heater. Routinely, we try to carry about 100 hours of fuel and our maximum is only another 25 beyond that. To motor from here to Whangarei is about 20 hours (and 100 NM) more than the balance of our fuel. So obviously the first safety measure is to reserve our heater tank in case we need it. The crew look like a bunch of tanned sausages stuffed into dirty blue and white and grey fleece rolls. We are baking today -- twice. Even the cat is taking extraordinary measures and actually *gasp* slept with a crew member last night. So it was with relief that DrC and I put out the jib this morning and got us moving under sail. The longer we sail, the sooner the mathematics of passage making and safety will let us turn ont he heater.